I’m one of those rare folks who use very few skin care products. The ones that I do use are single ingredient products or contain very few ingredients. And those ingredients are not chemicals, so there’s no need to decipher unpronounceable terms and determine if such ingredients are gluten free or not. I am often contacted by skin care company representatives and friends who have become independent distributors for such companies. As much as I want to support my friends in such endeavors, when I look at the ingredients and see mostly chemicals, especially ones like cancer-causing parabens, I have to decline. So it’s wonderful when I don’t have to decipher ingredients and can recommend wonderful, naturally gluten-free skin care products like MadeOn Skin Care products. MadeOn Skin Care products are ones that I can wholeheartedly recommend. It’s a family run business that was started by Renee Harris as a solution to heal her own dry, cracked, and, as a result, pain-ridden hands. You can watch Renee talk about her company and her products via YouTube here. I’ve been using MadeOn products for over a year now and even gave several MadeOn Skin Care gift packs to family members for Christmas last year. I love that the gift packs come in small muslin tote bags. Just tie on a gift tag and/or pretty red ribbon and you’re all set! I also gave some of the hair butter to a dear friend with super curly hair; she loves the product. Let’s talk about the specifics on the products themselves a moment. What’s in the hard lotion? In the standard Bee Silk hard lotion, you’ll find shea butter, coconut oil, and beeswax. That’s it! You know I love the beeswax factor, and it’s the beeswax that helps hold in the moisture once applied. In the Au Chocolat version, you’ll find cocoa butter, coconut oil, and beeswax. It will come as no surprise to those who know me well that I love this one. You can guess why! The hair butter contains shea butter, coconut oil, beeswax, and orange essential oil, and my friend loved it! There are some great testimonial videos on the hair butter on the MadeOn website, too. There’s also lip balm, diaper rash cream, bug block, goat milk soap, and much more. There are even DIY kits so you can make your own skin care products! MadeOn always offers free shipping on orders over $45, but gfe readers can use the code “ship25” to get free shipping for all orders over $25. UPDATE: This giveaway is now closed. Thanks so much to all who entered! Remember that you can still use the “ship25” code for free shipping on orders over $25 (U.S. only) at MadeOn’s site. ~ Tweet the giveaway. Leave a comment. ~ Share this giveaway on Facebook. Leave a comment. ~ “Like” MadeOn on Facebook. ~ “Like” gfe on Facebook. This giveaway will end Friday, December 14, at midnight EST. Full disclosure: At one time, MadeOn Skin Care provided products to me and a giveaway winner free of charge. MadeOn is also offering the products for this giveaway free of charge. Looks like a wonderful company. Love the idea of the kit, too. I want the au chocolat bar! I bet it’s amazing! I also like MadeOn on facebook. Thanks for the giveaway! The bee silk hard lotion sounds amazing. My skin is so dry and I have a hard time finding a lotion that is gf that helps with the dryness. I liked MadeOn on facebook. I already like gfe on facebook. I’d love to try the Hair Butter! I work outside in the cold, dry winters of the AZ desert (yes, it gets “cold” here! My hands are already starting to crack and snag my clothes! I’d love the hard lotion! I liked MadeOn, I already like gfe, and I tweeted and shared this giveaway! Hoping I win! I have gifts to buy for my coworkers! ooohhh…I would love to try Au Chocolat! Sounds good enough to eat! Now I follow MadeOn on facebook. The hard lotion sounds fabulous! I have really dry skin in the winter so that would be perfect for me! I like MadeOn on Facebook! I love the sound of the hard lotion! I’d love some hard lotion bars! The hard lotion sounds fabulous! Thanks for the tip for an awesome company!! I recently found this product and many great others, by ordering the e-book giveaway. That was an awesome deal. 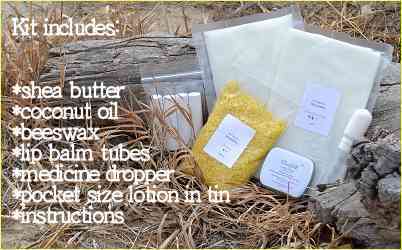 I ordered a kit to make my own, and free tinted lip balm, and sample of Bee Silk. THIS IS AWESOME! I could actually rub on my elbows and heels and feel the difference. Hope to ein this and some other awesome items. Shea butter, coconut oil & beeswax–& nothing else–sounds AMAZING! My skin has been so irritated! I have a bar of the MadeOn Au Chocolate Hard Lotion and I love it! I would like to win so I can try some of the other products. We would use the hard lotion the most. I am purchasing it for a gift for my husband, he gets horribly cracked skin in the winter and the less ingredients the better for a great healing lotion. The lotion in a tin sounds amazing! Thanks for the chance to win! Already liked on Facebook (my username on Facebook is Amy Marie). I would like to try the Hard Lotion. I always have cracks on my fingers. Hard butter sounds like a great product! My whole family would probably benefit from the lip balm. I already “liked” gluten free easily on facebook. I’d love to try the Bee Silk. I do lots of crafts that are hard on my hands. This sounds like it would be great! I like MadeOn on Facebook. I want to try it all! With two of us in the family with sensitive skin, fewer ingredients = BETTER! I like the idea of the hard lotion bars. the Bug Block would be great to send with a kid to camp, too, and to pack in the baseball equipment bag. Au Chocolat – that one must smell and feel amazing. My mother has had problems for years with dry cracked hands and even her head to the point of bleeding. 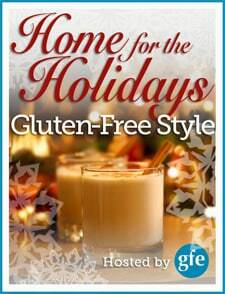 These products, particularly the hair butter, sound perfect for her, since we have so much gluten intolerance in the family. I would love to try this product. I think the Bee Silk would be best for my family. I dont use many products but the hard lotion sounds great. I dont use alot of lotion because of allergies, chemicals in them. This one sounds great and easy to travel with and also the lip balm. My husband uses lip balm and finding a good clean product that is awesome. I’d love to try the hair butter for my curly/frizzy hair. I’d love the DIY kit as well so I can make a bunch of bars for myself and friends! This time of year is perfect for lip balm but I confess I’m curious about the hair butter. Thanks for the chance to win. Hello! The hard lotion sounds like what this Canadian chick needs alot of, right about now! The prairie winter dries up a gals hands 🙂 I think that the bug protection one would smell so good too. These natural products sound fabulous. I would love to try the Calendula Goat Milk Soap and the Au Chocolat lip balm! I’d never heard of this brand, but it sounds right up my alley – thanks for sharing Shirley! I’d be all over the hard lotion bars (love the idea of the bug block, too!) and am already having trouble resisting the tinted lip balm! Thank you for this website. I have been diagnosed with celiac and I have been looking for skin products all over. I am going to look over the complete web site and will be ordering something real soon. Are you in Canada? The hair butter and DIY kit! I follow you on FB and I stalk your website! LOL! I follow MadeOn on Facebook. The hard lotion appeals to me. My hands are awful in the winter! I “like”d GFE on facebook. I “like”d MadeOn on facebook. I’ve tried the hard lotion, bee silk jr, and rash cream, and I love it all! I’d love to win this giveaway! I would love to try the plain hard lotion. I have been wanting to for a while. I would love to try the hard lotion because my hands (and feet) are super dry. Thank you for the giveaway. I really love the hair butter because it’s really moisturizing to my dry scalp. I’m a fan of MadeOn on Facebook. I like gfe on Facebook. The hair butter sounds great! Thanks for the giveaway! The lip balms and the Au Chocolat hard lotion sound amazing. I can’t wait to try some of the Beesilk Jr on my toddler. I have to say that all the products sound fantastic and am hard pressed to choose just one. I love the pocket size! I have had several hard lotions and love the way they work. I would love to try this. 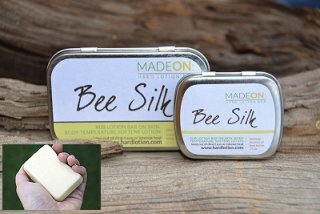 Bee Silk sounds great for winter skin. This super curly haired girl might just love their hair butter! It all sounds lovely. Great giveaway, Shirley. Hope you are doing well. I Like MadeOn and I Like gfe on Facebook. I would love to try the hair butter on my wild crazy hair! The chocolate balm sounds awesome too! I have used the hard lotion, lip balm, Beesilk Jr. and the goat milk soaps. All of them are wonderful!! Love the hard lotion bars!!! I use it for everything! Chapped hands, lips, little kids. I am almost out so I would love to win! Would live to try the hair butter! Thanks. Thank you so much for this wonderful giveaway Shirley. I am really looking forward to trying the MadeOn Skin Care products and am thrilled that I was the fortunate winner of this wonderful prize. Please pass on my thanks to MadeOn Skin Care as well! Wishing you and your family (and all of your readers) a very Merry Christmas and a healthy, happy 2013!